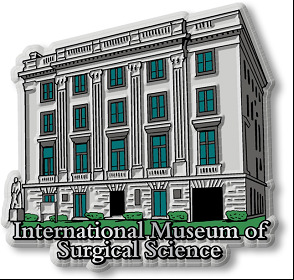 Take the International Museum of Surgical Science home with this new molded Museum building magnet! The magnet features a metallic silver finish. The International Museum of Surgical Science is currently housed in the historic lakeside mansion which was constructed in 1917, under the careful direction of Eleanor Robinson Countiss to house her family. Her father, JK Robinson, an executive of the Diamond Match Company, generously provided the home building fund. The elegant structure was designed to follow the historic lines of Le Petit Trianon, a French chateau on the grounds of Versailles completed in 1770 by architect Ange-Jacques Gabriel, and remembered as the playhouse of Marie Antoinette. The architect Howard Van Doren Shaw was hired to design the Countiss House with modifications including a fourth floor and a carriage drive.